The hunters are Larry, Bonnie, and Michael. The three bucks were taken from the same winter wheat field and gross scored in the 120's, 130's and mid 140's. It was the first 3 days of the Kansas rifle season, and the weather was terrible. Cold, winds to 40 MPH - with wind chills down to around zero. 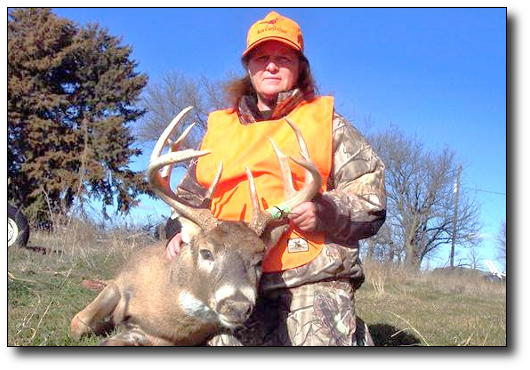 Bonnie shot her deer on the first evening as the deer came out to feed in the winter wheat. I was with her in a Double Bull blind. 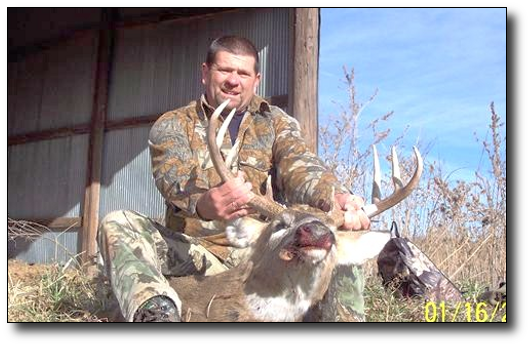 I shot my buck the second evening after hunting from a tree stand until just before dusk. I climbed down to walk up to the edge of the field to see if there were any deer in the field. Sure enough, about 200 yards away was a doe and a beautiful 11 point buck which I was able to take. 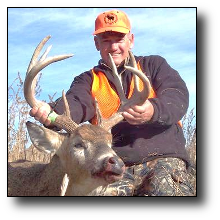 On the third evening Michael was hunting on the edge of the field when his real wide 8 point buck with several does came out to feed in the field.